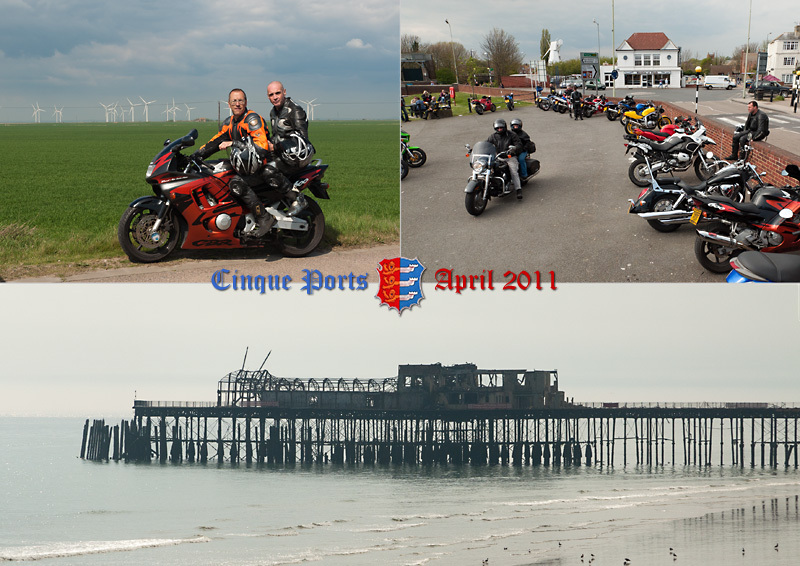 Some pictures from a motorbike ride to the “Cinque Ports” along the English Channel coast. Tony and I dropped in for coffee and a tasty bacon sandwich at David in Canterbury, then visited Hythe, Romney, the town of Rye and then Hastings before enjoying a delicious home-baked cake with Terry in his garden in Brighton. Then the ride back to London on the main road. Scenic road from Canterbury down to Hythe. The windmills on Romney Marsh were turning well. There were some posh motorbikes out on the roads but the motorbike stop and cafe in the town of Rye weren’t particularly busy. At Hastings… another Victorian pier sadly lost to fire. We missed out Dover and Sandwich was represented by the bacon sandwich! Here's my postcard from riding in Provence on clear dry roads yesterday and today; afternoon temperatures up to 20°C and the sun now has some strength in it. This has been clock change weekend in France just as in the UK. Also springtime so time to take my RR bike in for its service at Moto Peyrolles and then enjoy the roads around the lower Verdon river in the départments of Bouches du Rhone (13), Alpes de Haute Provence (04) and the Var (83). The no parking symbols looking similar to putting on the hour on the clocks but also indicative of the "keep out" nature of the countryside. 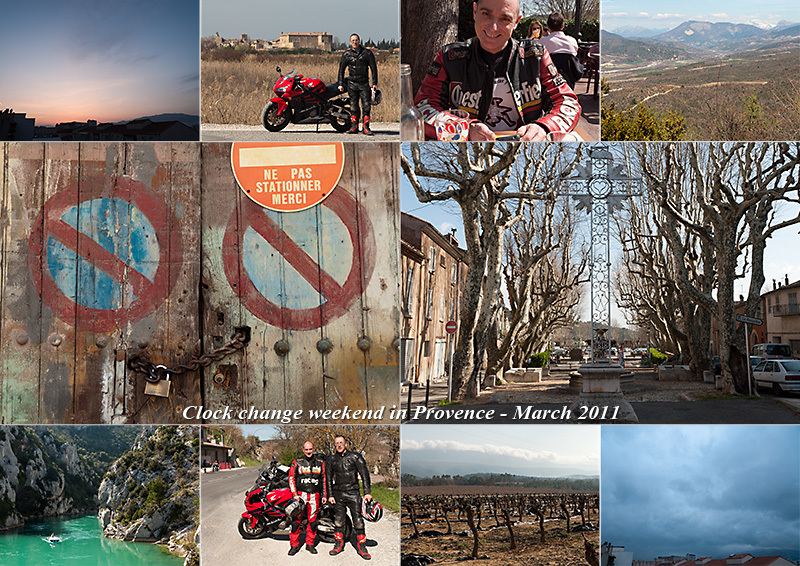 Plus the sequential frame travelogue story of my Saturday out motorbiking with my great friend Pascal, who first got me hooked on motorbiking in Provence. We met up at the bike shop in stone coloured Peyrolles, then had lunch outdoors under the chestnut trees in Greoux and a coffee at Quinson. Shame the weather got the story wrong: Saturday (on winter time) was brilliant and fine and Sunday (on summer time) is grey and threatening rain! But the rain over Mont Sainte Baume will be good for the old vines. 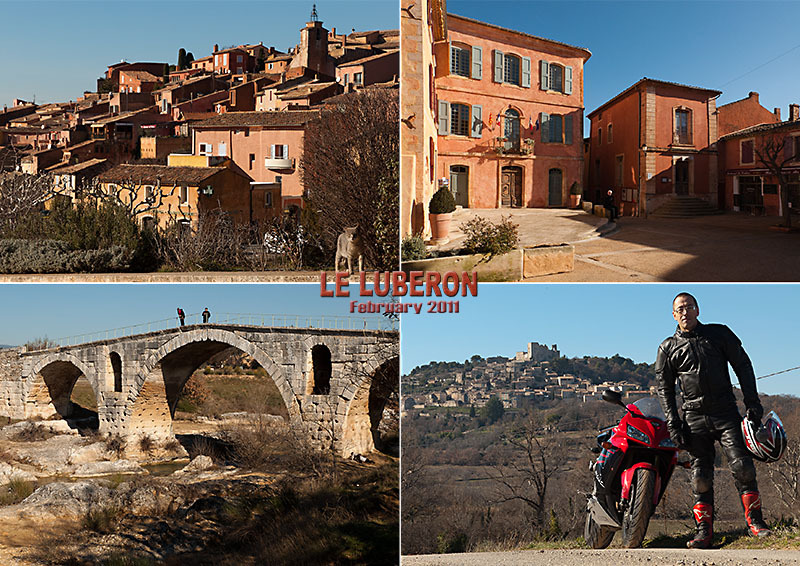 Great day out biking in the Luberon in Provence. Lots of fast toys on the move with riders practicing getting their knee down. Yes even in February: the clear skies only lasted a short way further North - I was speaking to a couple of riders from near Lyon. I used the Coombe de Lourmarin to cross the Luberon mountain through to Bonnieux. The castle behind me in the photo is at Lacoste, it belonged to the Marquis de Sade - you can see the famous tower descibed in his "journal". Now the grounds are used in the summer for outdoor classical and jazz concerts! We've had a couple of brilliant days in Marseille with clear blue skies, moderate temperatures (although the Mediterranean sun is still very strong. The new battery in my bike failed dead at the first attempt at starting so that was another day spent fault finding. But Thursday also dawned bright and clear so I set off towards Barcelonnette and the col de la Bonette. This last weekend in May was a frustrating weekend as the weather wasn't good enough for bike riding in the high Alps as we had planned, some of the passes in the high Alps aren't open even yet. Marseille continues to entice and infuriate in equal measure. My motorbike let me down out on the Col de l'Espigoulier, one of the hills surrounding Marseille, happily I was able to bump start it and return home and it was only the battery which needed replacing. But relatively out on limb and also in a still foreign country, these things are much more difficult. All fixed by the end of Saturday and although I was too knackered to go out with my friends as planned (we'd already had a late night on Friday) I was able to enjoy the Eurovision song content from the comfort of my own place with my own stuff around me and some nice wine and food that I made myself at home. In this case, the sound of many other televisions echoing around the inner courtyard added to the atmosphere: the slogan of the show was "Share the moment".